The 5,670-square-foot Faneuil Hall Sephora sits on a triangular site in the northern corner of the marketplace along North Street. Elkus Manfredi Architects‘ shiny new Sephora has claimed a coveted corner of the historic Faneuil Hall Marketplace, adding yet another style of architecture to downtown Boston. The 5,670-square-foot store sits on a triangular site in the northern corner of the marketplace along North Street, across from Boston’s Brutalist City Hall (1968) and facing the Greek Revival–styled Quincy Market (1826). The small glass pavilion’s transparency stands in stark contrast to the brick and concrete structures that surround it. With its fluid form and free flowing metal roof system, the project is unmistakably contemporary. 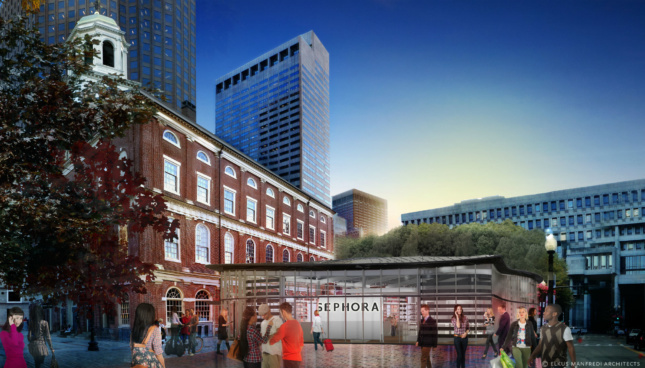 “We feel that this 21st century transparent building not only highlights Sephora’s brand image, but allows the nearby historic 18th century Faneuil Hall and 19th century Quincy Market landmark buildings to shine,” said Howard Elkus, founding principal of Elkus Manfredi Architects, in a press release. The new store is part of a larger master plan proposed by Ashkenazy Acquisition Corporation (AAC), which is striving to refresh the market and introduce more accessible programming to downtown Boston. 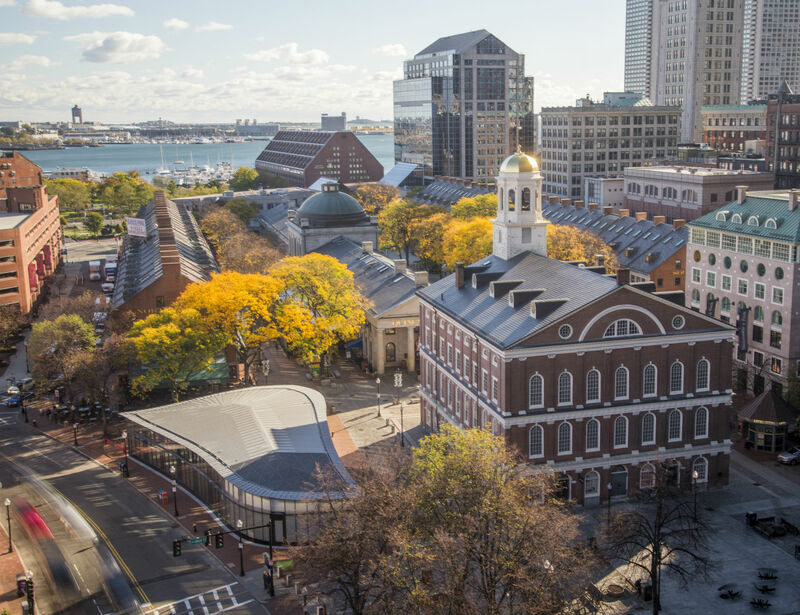 As the master plan continues to transform the Marketplace, AAC aims to strike a balance between local businesses and national brands like Sephora and Uniqlo, a Japanese clothing brand who opened their Boston flagship store in Quincy Market in 2015. They hope this curated mix will help make Faneuil Hall Marketplace a year-round destination for tourists and locals alike.